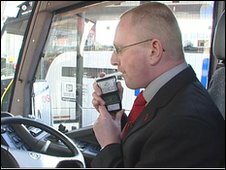 A system measuring alcohol levels in coach drivers has been introduced by National Express. 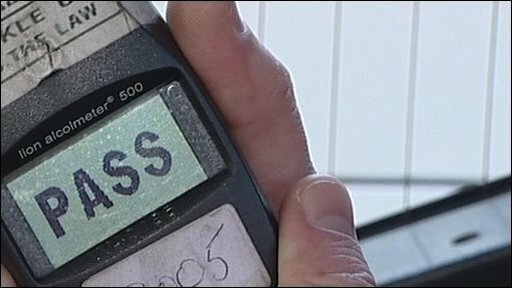 The breathalyser-style device disables the vehicle if the driver is over the limit and the firm's Birmingham control room alerted. The company spent two years trialling the system, which will be fitted to its fleet of more than 500 vehicles. In 2008, a National Express driver who was over the limit was jailed after his coach crashed and overturned on the M1. The driver, Leslie Weinberg, 35, was cut from the wreckage of the coach when it crashed at Newport Pagnell Services. Weinberg pleaded guilty, at Aylesbury Crown Court, to driving dangerously and driving with excess alcohol. National Express operations director Alex Perry said: "We had a very thorough investigation, we learned some lessons from it, it's a system we can roll out across the fleet and it would prevent such accidents in the future." Alcolock was invented in Sweden, where it is commonplace in commercial and private vehicles and is compulsory on all public service vehicles in France. The limit on National Express coaches is lower than the national drink-drive limit of 35 micrograms per 100ml of breath. If a driver fails the test a signal is sent to the control room giving the registration number of the vehicle and how much alcohol has been registered. Driver Simon Hetherington said: "I think it's been a positive step in moving forwards for passenger safety and it's been met with a good response by the drivers."